While the popularity of content marketing is beneficial for writers, SEO pros and the companies providing content optimization and analytics tools, the downside is that more brands are developing content, leading to more competition and more overall noise. 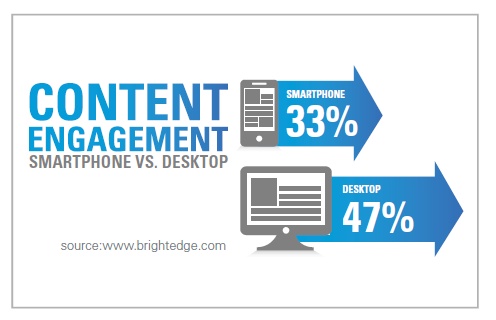 BrightEdge, a content performance marketing platform, wanted to provide insights into how marketers can ensure their content cuts through the noise and look at the factors that improve and hinder engagement, as well as see how mobile and desktop stack up. What BrightEdge found is that engagement - defined by the company as traffic, conversions and revenue - is the single biggest driver of content performance. Makes sense, right? If end-users are not visiting the content, sharing the content (which can be seen through extra traffic) and acting on the content (conversion and revenue), then the content has failed to do its part to influence the end-user to engage with the brand and, ultimately, buy. BrightEdge's report provides more detailed findings regarding industry benchmarks, including for B2C brands, consumers only engage with 20 percent of content on average. For B2B, average engagement is higher at 50 percent of content. Engagement rates vary across specific industries, but, according to the report, hover between 33 and 50 percent of content overall. Separated by industry, the graph above illustrates the differences in content engagement for hospitality, manufacturing, B2B technology, insurance and retail. The significant differences can be attributed, as detailed in BrightEdge's report, to their different sales tactics. Retail, for instance, delivers a variety of content formats, including product and category pages. What's more, their mass amount of content is often untargeted, focusing on top selling/popular products so the engagement levels will be lower. Conversely, hospitality is hyper-targeted to location and reasons for booking. Interestingly, BrightEdge also looked at engagement levels by smartphones and desktop computers, finding, "that although smartphones lead all device categories in market penetration, they lag behind desktop engagement by 30 percent." Similar to the industry breakdown of engagement levels on the whole, there are disparities between desktop and mobile engagement in the different industries as well but across the board desktop trumps mobile when it comes to engagement levels. The good news for brands allocating a lot of their budget toward mobile, however, is that BrightEdge's data shows more othan 1 in 4 mobile sites is misconfigured, resulting in an average 68 percent loss of smartphone traffic to that content - presenting a significant opportunity to capture the time and money of mobile users on sites that are properly optimized for their devices.